In 1995 VLT introduced its famous time saving Above and/or Under Carriage Keyboards. 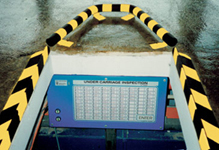 A very robust, designed VLT product (suitable for a rough environment, which guides the inspector through the test and in combination with the VLT Test Lane concept database, it tells the inspector by way of green LED's which items need to be inspected. If there are no fail items, the inspector simply presses the large enter key to confirm that the test is completed. If there are (major) items that fail, he presses the failed items key once and a red LED lights up, while the green LED goes off. If the selected item is a minor fail, he presses the failed key twice. The first time the red LED lights up and after the second time both the green and red LED's are on. This means that this item or items need no repair before passing the overall test. The VLT Above and/or Under Carriage Keyboard has 86 keys and a large enter key. The user can make changes on the keyboard if one is using the VLT Test Lane software module.